IMPORTANT: March 1, 2015 – The Spinfuel Eliquid Review Team will no longer review any eLiquid brand that does not offer secure packaging, including at least one of the following methods: Shrink-wrapped bottles, safety-caps, break-away caps, or child safety caps. Have you ever wondered why some eLiquids are awarded a Spinfuel Choice Award and others are not? For the latest information on how we score eliquids can be found in this article. We take each eLiquid Reviews seriously. The methodology we have developed has been carefully considered and constructed over the course of more than 4 years. We believe the results are the most accurate, balanced, and unbiased eLiquid reviews available anywhere. When an eliquid brand appears in Spinfuel for the first time we conduct and publish an Interview. It is important for our readers to understand the reasons, and the goals, of eliquid creators and their brands, and in the interview we hope to accomplish just that. Once published, our reviews become a permanent part of Spinfuel eMagazine and are available to our readers any time they wish to access them. The eLiquid companies/brands we have reviewed have reported huge residual sales several months after the initial publication date, sometimes extending years. The Spinfuel eLiquid Review Team for 2016 are, Julia and Kiera Hartley-Barnes, Tom McBride and Jason Little. Below are the steps the team takes to ensure a thorough, unbiased, and fair review. Step One: Once the eLiquids are received a ‘Team Leader’ (Head Writer) is assigned to head up the review. Each of the team members have specialties in certain flavors; tobacco, fruit and drinks, sweet, tropical, and so forth, but all are connoisseurs of eliquid. A balanced team leads to a more balanced and fair review. Step Two: Each team member receives an equal amount of each eJuice flavor. Each member uses various vaping hardware and prepares their individual tanks and RDA’s at least 24 hours in advance. No matter what the “age” of the eLiquid is when received by Spinfuel we “steep” the liquids for a minimum of 24 hours to a maximum of two weeks, to allow the maximum flavors to shine through. Step Three: The entire ‘team’ will vape the eLiquids exclusively for 72 hours. Vaping will occur as the result of normal vaping habits of each team member. Some may choose to move from flavor to flavor, others may choose to mix it up and go back and forth between flavors. During the review period no other eliquids outside the brand being reviewed is ever vaped by a member of the team. Step Four: Approximately 24 hours after the 72-hour ‘vaping’ period has ended the team meets to discuss their findings and develop a narrative for the review. During this meeting the flavors will be discussed thoroughly by all team members. Each member will have more than enough space in the final review to write about his or her impressions for each flavor. Each team member also submits a 5-point rating. 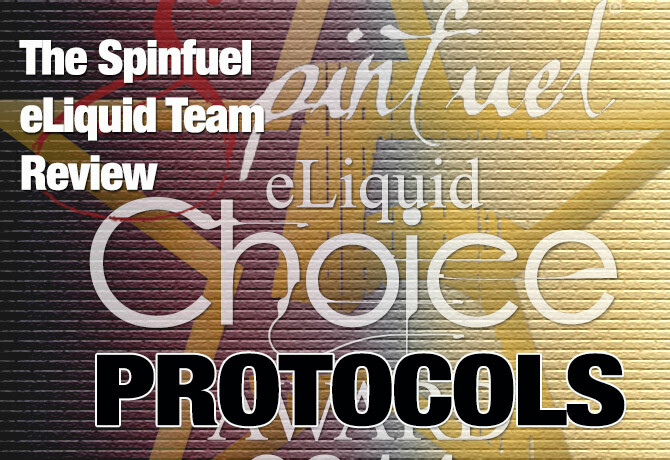 Flavors that are awarded 5-points by all the team members are awarded with a special “Spinfuel Choice Award of Excellence” (otherwise known as the Spinfuel Choice Award) designation and is so noted in the review with the Award graphic. This Choice Award graphic is exclusive to the year the eliquid was awarded and changes each year. Because eliquid companies change ownership or formulations, the year is an important consideration when you read the review. Just because an eliquid has earned the Choice Award for, say, 2013, doesn’t mean the eliquid would earn it in 2016. Although this is rare it does happen. Step Five: The lead writer transcribes the notes from the meeting and constructs a narrative review. Once it has been written it will be reviewed for accuracy by the team leader and the rest of the team. Changes, if needed, will be made at this time and all the team members will sign off on the final review. Step Six: The final review and interview are scheduled for publication. Publication is based on available spots in the calendar but usually no more than one week from the time the review and interview are completed and turned in to the editor. You will be notified prior to publication. The team uses a variety of hardware. Most eLiquids are vaped with Sub-Ohm tanks. At times, other methods are employed, including but not limited to the use of above 1.0-ohm coils and tanks. Our goal is to provide you with the most accurate assessment of each and every eliquid we review. Want to talk about our Protocols, or discuss certain brands, flavors, or anything else related to eliquid? Check out our new Community Forum!